I’ve always loved this shot, and I finally got it from my mom and scanned it for my collection. It really pings my love for 60s design and culture. I’ll bet my grandmother was really proud of that tree. That’s my dad posing alongside it at their house in Newport, Arkansas. 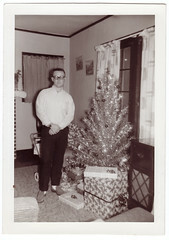 This was taken when he was in college, so some time in the early 60s.